Renew your trim's factory finish – with no streaking! Trim pieces on your vehicle add an extra aesthetic value to the car's overall appearance – that is, if you care for it properly. Just like paint, repeated exposure to UV rays, road grime, and everyday wear and tear can take its toll on your plastic trim surfaces. What was once black and luminous is now gray, streaked, faded, and tired looking. And now, restoring your faded trim doesn't have to be difficult thanks to McKee's 37 Plastic Trim Restorer! After a thorough cleaning with McKee's 37 Wax Remover for Plastic, apply McKee's 37 Plastic Trim Restorer directly onto a foam applicator. Work the restorer into the surface to be treated. On hard, smooth plastic, it may be necessary to buff off any excess product. Continue wiping until any excess product is buffed off. Your plastic trim is now restored and protected! Using a high-tech polymer coating system, McKee's 37 Plastic Trim Restorer goes below the top layer of your trim to fully condition and renew the original appearance. McKee's 37 Plastic Trim Restorer is a non-greasy formula that will completely dry to the touch, leaving behind a water-resistant protective layer that will not streak or run when wet. Additionally, McKee's 37 Plastic Trim Restorer is easily wiped off of surrounding surfaces (such as glass and paint) without causing damage if accidental exposure occurs. Is your trim brand new and already perfect? You can keep it that way with McKee's 37 Plastic Trim Restorer! Prevent all of the downfalls listed above by simply protecting your plastic surfaces from the get-go! 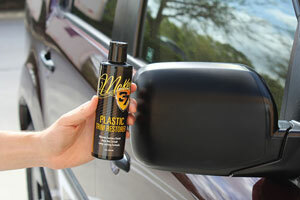 McKee's 37 Plastic Trim Restorer is a must for new cars – whether you have a ton of trim or not! Preventing a problem is always easier than trying to correct that problem later on. It is recommended that you first clean the surface thoroughly with McKee's 37 Wax Remover for Plastic – this will remove any leftover polishes or waxes that may have gotten on the surface and any other trim dyes that may be applied. Apply McKee's 37 Plastic Trim Restorer directly to a foam applicator and work into the surface. On hard, smooth plastic trim, you may need to buff off excessive product. Allow the surface to cure for 2 hours before getting wet.